Upgrading to a newer version of MapInfo? Whether you’re a seasoned MapInfo Pro user or just starting out, knowing a little about MapInfo Pro licensing and serial numbers will make your upgrade as simple as a few clicks. 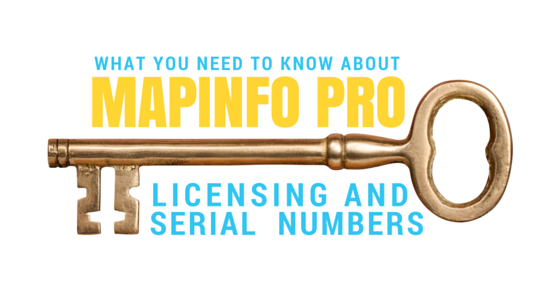 In this post we will cover-off some of the most common questions we get around license (serial numbers) and activation codes for MapInfo Pro. Put simply, serial numbers and activation codes are tied to each (full release) of MapInfo Pro. A serial number and activation code that you have for an earlier version will not work for a newer version of MapInfo Pro. This is because each (full) release of MapInfo Pro is its own separate installation and will come with a serial number and activation code for that version. What this means is that you don’t really upgrade MapInfo Pro but (typically) uninstall the older version and install the newer one. Patch/maintenance releases are different and will not need licensing. So how do you tell the “version” of a serial number? Good question. We cover the components of serial numbers in the next section, but in regards to version numbers it relates to the first 4 numbers in the serial number. The examples below show dummy serial numbers for different versions of MapInfo Pro. In addition to being version specific, serial numbers also contain codes that correspond to different types of functionality as shown in the image below. If your organisation has multiple licenses of MapInfo Pro with differing levels of functionality it is important that you supply the correct serial number to the appropriate users. For example, if you have upgraded one of your users to MapInfo Pro Advanced you will need to supply them the license that starts with “MA”. Understanding serial numbers is really useful for troubleshooting activation or upgrade issues. When working with customers to solve any activation or upgrade issues we always ask what serial number they are working with and the version number they are trying to use it with. What about 32 and 64bit? For the MapInfo Pro v15 and v15.2 releases, the serial numbers and activation codes will activate both 32 and 64-bit versions of MapInfo. This means that you could install and activate the 32-bit version with the supplied codes, and then install the 64-bit version and activation is as simple as entering the serial number and activation code. This is because the system will utilise the license that is already on the computer. This means that where some additional tools like RouteFinder that have not yet been upgraded to a 64-bit version you can still run them in the 32-bit version and then the resulting data can be used in your analysis and visualisation in the 64-bit version. If both versions are installed it is important to not return the license if you uninstall either the 32 or 64bit version. If you do return the license when uninstalling it will remove the license that is shared by both versions and the remaining install will stop working. You can easily activate the remaining installation but it’s just something to keep in mind. Please note, the serial number and activation code for MapInfo Pro v16 will only work for 64-bit. What should I do if upgrading my PC? The best-practice here is to install the version(s) of MapInfo you need on the new PC and utilise the 30-day evaluation period before transferring your license to the new PC. This allows you to copy your data or test that the files on your network are opening correctly on the new PC. If your tables and workspaces are opening as expected, you can then transfer the license from the old PC and then activate the license on the new PC knowing that everything is working as expected. What if my PC dies? Firstly, my deepest sympathies at the sudden loss of your dear friend. You probably saw the warning signs but chose to ignore them and squeeze the last gasps out of your 5-year-old friend until it was too late (hey, we’ve all been there!). But on the serious side you have some options depending on what IT decide to do with your faithful companion and knowing that the license is tied to that PC. If IT decide to rebuild your PC then you can install and activate the same version that was previously installed by entering in your assigned serial number and activation key. In this scenario, the license server will recognise that the PC was previously licensed and activate MapInfo. If you are bestowed a sparkly new friend, congratulations. However, unless you were able to predict the future, your license is probably sitting idly inside a PC that no-longer works. If IT can bring it back to life you could then re-install MapInfo and then safely transfer the license for use on the new PC, otherwise it’s a call to Critchlow support (New Zealand) or Pitney Bowes Support for more assistance. We’ve gone into a decent amount of detail here and hopefully filled-in some gaps around your knowledge of licensing for MapInfo Pro. The key things to remember are that each full version comes with a new serial number and activation code, and the serial number controls the level of functionality. We haven’t covered off the new licensing type that has come with the MapInfo Discover 2015 Bundle but you can find more information about that in this FAQ. If you haven’t yet downloaded the latest version of MapInfo Pro, which includes access to a trial of Advanced, you can do so below.